The Lone Star state generated 1.2bn barrels of crude oil and condensate in 2015, and 8.5 Tcf of natural gas thanks to multiple shale plays and producing regions, according to the Texas Railroad Commission. That production came out of 323,659 active wells in Texas (there are another 111,704 inactive wells). The state has extensive infrastructure to get those hydrocarbons to market with 431,997 miles of all types of pipeline, according to TXRRC data. West Texas Intermediate crude oil serves as a benchmark for crude oil pricing in North America. The largest refining center in the United States is located along the Texas Gulf Coast. More than 25% of the nation’s proved natural gas reserves are in Texas. 1 U.S. Census Bureau, Geography, State Area Measurements and Internal Point Coordinates (2010). 2 Texas State Historical Association, Texas Almanac, Environment, accessed December 6, 2015. 4 American Wind Energy Association, Texas Wind Energy, accessed December 6, 2015. 5 Nielsen-Gammon, John, Texas State Climatologist, The Climate of Texas, accessed December 6, 2015. 6 U.S. Census Bureau, Population Estimates, State Totals: Vintage 2014, Tables, Annual Estimates of the Resident Population for the United States, Regions, States, and Puerto Rico: April 1, 2010 to July 1, 2014 (NST-EST2014-01). 7 U.S. Census Bureau, Statistical Abstract of the United States: 2012, Table 671, Gross Domestic Product Current and Chained (2005) Dollars: 2000-2009. 8 U.S. Department of Commerce, Bureau of Economic Analysis, Regional Data, GDP by State, California, New York, and Texas, for 2012, 2013, and 2014. 9 U.S. Energy Information Administration, U.S. States, Texas, Energy Indicators, accessed December 6, 2015. 10 U.S. Energy Information Administration, State Energy Data System, Table C4, Total End-Use Energy Consumption Estimates, 2013. 11 U.S. Energy Information Administration, State Energy Data System, Table C10, Energy Consumption Estimates by End-Use Sector, Ranked by State, 2013. 12 Netstate, The Economy of Texas (June 13, 2015). 13 U.S. Energy Information Administration, Manufacturing Energy Consumption Survey, Table 3.2, Fuel Consumption 2010. 14 U.S. Energy Information Administration, State Energy Data System, Table C10, Energy Consumption Estimates by End-Use Sector, Ranked by State, 2013. 15 U.S. Census Bureau, Table 1098: State Motor Vehicle Registrations, 1990-2009. 16 U.S. Energy Information Administration, Household Energy Use in Texas, accessed December 7, 2015. 17 Nielsen-Gammon, John, Texas State Climatologist, The Climate of Texas, accessed December 6, 2015. 18 U.S. Energy Information Administration, Crude Oil Proved Reserves, Reserve Changes, and Production, 2009-14. 19 U.S. Energy Information Administration, Top 100 U.S. Oil & Gas Fields (March 2015), p. 5-7. 20 U.S. Energy Information Administration, Crude Oil Production, 2009-14. 21 U.S. Energy Information Administration, Petroleum & Other Liquids, Table Definitions, Sources, and Explanatory Notes, West Texas Intermediate (WTI – Cushing), accessed December 7, 2015. 22 U.S. Energy Information Administration, “Crude oils have different quality characteristics,” Today in Energy (July 16, 2012). 23Wooster, Robert, and Christine M. Sanders, “Spindletop Oilfield,” The Handbook of Texas Online, Texas State Historical Association (June 15, 2010). 24 Kim, Eugene, Texas Oil and Gas, p. 3-3, accessed December 6, 2015. 25 U.S. Energy Information Administration, Texas Field Production of Crude Oil (Annual, Thousand Barrels per Day), 1981-2014. 26 U.S. Energy Information Administration, Refinery Capacity Report, Table 3, Capacity of Operable Petroleum Refineries by State as of January 1, 2015, p. 17-22. 27 U.S. Energy Information Administration, Number and Capacity of Petroleum Refineries, Atmospheric Crude Oil Distillation Operable Capacity, Annual (as of January 1), 2009-15. 28 U.S. Energy Information Administration, “Much of the country’s refinery capacity is concentrated along the Gulf Coast,” Today in Energy (July 19, 2012). 29 U.S. Energy Information Administration, Oil: Crude and Petroleum Products Explained, Refining Crude Oil, accessed December 7, 2015. 30 U.S. Energy Information Administration, Refinery Net Production, Texas Gulf Coast, Annual Thousand Barrels, 2009-14. 31 U.S. Energy Information Administration, Crude Oil Input Qualities, API Gravity, Annual, 2009-14. 32 U.S. Energy Information Administration, Crude Oil Input Qualities, Sulfur Content, Annual, 2009-14. 33 U.S. Energy Information Administration, “PADD regions enable regional analysis of petroleum product supply and movements,” Today in Energy (February 7, 2012). 34 U.S. Department of Energy, Office of Fossil Energy, SPR Quick Facts and FAQs, accessed December 7, 2015. 35 U.S. Energy Information Administration, State Energy Data System, Table C11, Energy Consumption Estimates by Source, Ranked by State, 2013. 36 U.S. Census Bureau, Population Estimates, Vintage 2013, Tables, Annual Estimates of the Resident Population for the United States, Regions, States, and Puerto Rico: April 1, 2010 to July 1, 2013 (NST-EST2013-01). 37 U.S. Energy Information Administration, State Energy Data System, Table C2, Energy Consumption Estimates for Major Energy Sources in Physical Units, 2013. 38 U.S. Energy Information Administration, State Energy Data System, Table F12, Liquefied Petroleum Gases Consumption Estimates, 2013. 39 Texas Comptroller of Public Accounts, The Energy Report (May 2008), Chapter 6, Liquified Petroleum Gas. 40 American Petroleum Institute, “U.S. Gasoline Requirements” (June 2015). 41 U.S. Energy Information Administration, Natural Gas Gross Withdrawals and Production, Marketed Production, Annual-Million Cubic Feet, 2009-14. 42 U.S. Energy Information Administration, Top 100 U.S. Oil & Gas Fields (March 2015), p. 8-10. 43 U.S. Energy Information Administration, Texas Natural Gas Marketed Production (Million Cubic Feet), 1967-2014 (November 30, 2014). 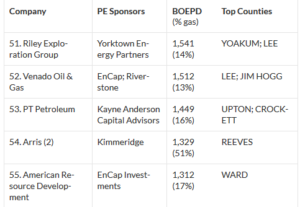 44 Hiller, Jennifer, “Eagle Ford Shale Tops Texas List of Top Crude, Gas Producers,” Fuel Fix (August 1, 2015). 45 U.S. Energy Information Administration, “Shale Gas Provides Largest Share of U.S. Natural Gas Production in 2013,” Today in Energy (November 25, 2014). 46 Texas Railroad Commission, Major Oil & Gas Formations, see: Barnett Shale Information, Eagle Ford Shale Information, Haynesville/Bossier Shale Information (November 18, 2015). 47 Texas Railroad Commission, Eagle Ford Shale Information (November 18, 2015). 48 U.S. Energy Information Administration, Natural Gas Reserves Summary as of Dec. 31, Dry Natural Gas, Annual 2009-14. 49 Texas State Library and Archives Commission, Hazardous Business: Industry, Regulation and the Texas Railroad Commission, Other Responsibilities (August 18, 2011). 50 U.S. Energy Information Administration, International & Interstate Movements of Natural Gas by State, Texas, Annual 2009-14. 51 U.S. Energy Information Administration, Natural Gas Market Centers and Hubs in Relation to Major Natural Gas Transportation Corridors, 2009. 52 U.S. Federal Energy Regulatory Commission, North American LNG Import/Export Terminals (October 20, 2015). 53 Macquarie, “Macquarie Energy and Freeport LNG Expansion, L.P., to Jointly Develop U.S. LNG Export Project,” Press Release (November 22, 2010). 54 Moore, Sarah, “Sabine Pass Terminal Gets its First Shipment of LNG,” Fuel Fix (October 22, 2010). 55 U.S. Department of Energy, Office of Fossil Energy, Long Term Applications Received by DOE/FE to Export Domestically Produced LNG from the Lower-48 States (as of December 4, 2015). 56 “EIA: LNG Export Terminals Under Construction, More Planned,” OilOnLine Press (April 17, 2015). 57 U.S. Energy Information Administration, Underground Natural Gas Storage Capacity, Total Storage Capacity, Annual, 2008-13. 58 U.S. Energy Information Administration, Underground Natural Gas Storage Capacity, Total Number of Existing Fields, Annual, 2008-13. 59 U.S. Energy Information Administration, Underground Natural Gas Storage Capacity, Number of Depleted Fields, Annual, 2008-13. 60 U.S. Energy Information Administration, Underground Natural Gas Storage Capacity, Number of Existing Salt Caverns, 2008-13. 61 U.S. Energy Information Administration, Texas Natural Gas Underground Storage Volume, January 1990-October 2015. 62 U.S. Energy Information Administration, Natural Gas Consumption by End-Use, Total Consumption, Annual, 2009-14. 63 U.S. Energy Information Administration, Natural Gas Consumption by End-Use, Texas, Annual, 2009-14. 64 U.S. Energy Information Administration, Natural Gas Consumption by End Use, Volumes Delivered to Industrial Consumers, Annual, 2009-14. 65 U.S. Energy Information Administration, Natural Gas Consumption by End Use, Volumes Delivered to Electric Power Consumers, Annual, 2009-14.